First, let’s see what Baidu is. Baidu is a Chinese Web Services Company started in Beijing in January 2000. Baidu, literally ‘hundreds of times’ represents the persistent search for the ideal. Its service repertoire comprises a Chinese language Search Engine for websites, audio files and images; 57 community services, including an online encyclopedia and a discussion forum searchable on keywords. It was the first company in China to offer WAP and PDA based mobile search. In 2007, it became the first Chinese company included in NASDAQ’s 100 index. In 2011, Alexa Internet rankings put it in 6th place. Of the more than 4 million search queries in China, Baidu’s share was over 55%. Baidu’s share in Chinese internet search revenue for 2011 Q2 was a whopping 76%. Google is the king of web search the world over, except in China. Google comes in at a distant second to the no.1 Chinese search engine, Baidu. Realizing that it would be difficult to catch up with Baidu, Google China decided to stop censoring search results. This earned them a few pats on the back as upholders of free speech; but Google.cn search results still vary from Google.com in content. This was clearly more of a business decision. It is till hazy whether Google will leave China, with officials claiming that even if it happens, Google will not be affected. But the fact remains that China is the world’s most populous state with millions of internet users; figures that simply cannot be ignored. Similar to Google, Baidu earns its revenue through online advertising which comes from a number of small businesses rather than few big corporates. When Google threatened to leave China after the server hacking incident, it was a boost for Baidu; they would be able to bag Google’s market share too. Alexa tells us that nearly all visitors to Baidu.com are Chinese, with majority being females in the 25-34 age groups. The statistics also say that many of these females have children and are not very highly educated. Google visitors, on the other hand are older, lesser number had kids, and were more educated. In a country where censorship and secrecy is the norm, Baidu has been accused of violating ethics and tilting search results in favor of higher paying clients. In the turbulent Chinese economy, its future therefore is not going to be a bed of roses. So, though Google has probably been beaten in China, it is still the world’s favorite to-go place for search. It’s a $183 billion company to Baidu’s $19.1 billion (market capitalization). Google has links to 727,036 sites to Baidu’s 58,665. It is too early to say if Baidu will better Google anywhere out of China, because it is, after all a Chinese search engine. 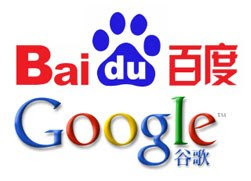 Eventually Google’s internationalized business model is more likely to prevail over Baidu’s localized one.